103rd day of the year. There were then 262 days left in 2019. 25th day of Spring. There were 70 days left till Summer. April 13, 2019 was the 39th day of Lent (Christian Observance). fight for the good life. it’s worth it. 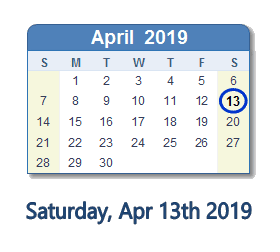 What happened on April 13th 2019?